All cats and kittens are built like their ancestors. Orijen believes they should eat like them, too. That’s why all Orijen cat foods feature exceptionally high inclusions of fresh, whole meats plus richly nourishing liver, tripe, cartilage and marrow. All cats and kittens are built like their ancestors. Orijen believes they should eat like them, too. That’s why all Orijen cat foods feature exceptionally high inclusions of fresh, whole meats plus richly nourishing liver, tripe, cartilage and marrow – all in ratios that mirror the natural feline diet – while excluding high-glycemic carbohydrates and plant proteins that simply don’t belong. Prepared from authentically fresh, regional ingredients in their award-winning kitchens, Orijen keeps your cat or kitten happy, healthy and strong. Read the ingredients and you’ll be happy too! 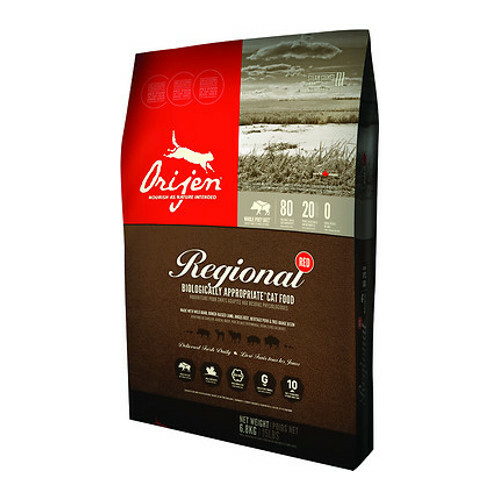 Orijen Regional Red is a symphony of fresh Angus beef, wild boar, Alberta lamb, heritage pork and bison – all ranch-raised within Orijen’s region by people they know and trust – in a meat and protein-rich formula that’s unmatched in nutrition and taste.